Virus is a great example of the beauty of Kickstarter, the popular project funding site that allows anyone with an idea to pose it to the masses and ask for help to see their dream come to fruition. That’s exactly what local game developer Mark Basker did last summer, when he launched and successfully funded his first project with his Euless-based company, Around the Clock Games. 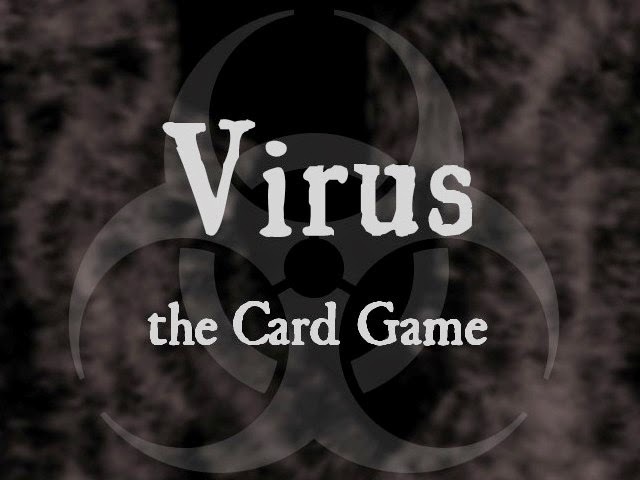 Virus is a simple set-collection game for 2-4 players. The first player to develop a 100% lethal virus strain is the winner, while humanity is the loser! The Virus game deck is composed of 72 cards that give you all you need to create the deadliest virus strain you can. There are 12 transmission cards, 12 vector cards, 46 mutation cards and 2 rules cards. The game is very simple and short, can be taught in a matter of minutes and played in 5-10 minutes. Virus is a great game to have on the go or for in between games at your FLGS or Nerd Night event. Game setup is quick, just a quick shuffle of the deck and a deal of six cards to every player gets you started. All players simultaneously lay down the cards they wish to play from their hand, the only caveat being the first card or cards you play must be transmission cards. 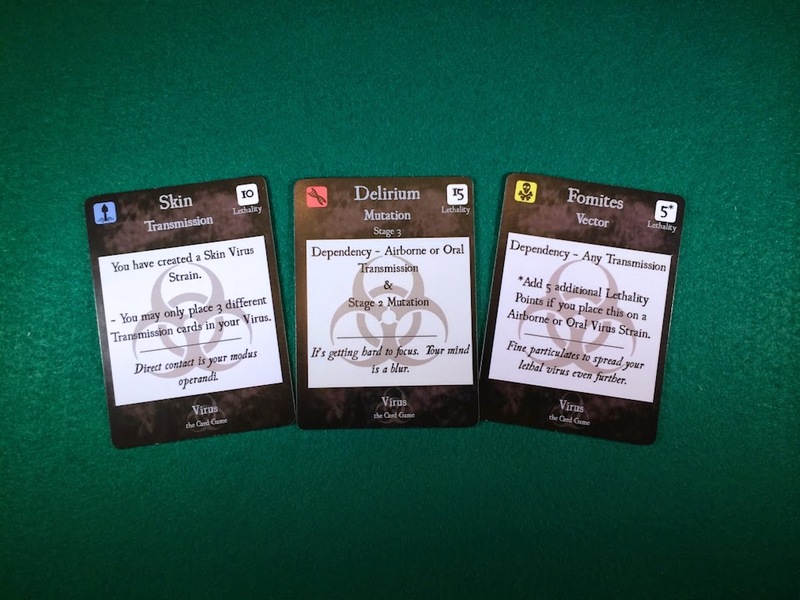 There are six types of transmissions in Virus, with two of each card in the deck. Skin, airborne, gastrointestinal, blood, oral and vertical strains make up the bases upon which you build your virus. Once you’ve laid down the transmission cards, you work to build your virus to a 100% lethality rating. Every card has a lethality score in the top right corner, from as low as 5 to as high as 25. Creating your virus is simply a matter of placing vector and mutation cards behind or in front of your transmission cards respectively, provided they match the strain you are working on. After you’ve placed the cards you can play, you must discard your hand or keep a single card. On your next turn, you will draw back up to a full hand of six cards. For example, you start with a skin transmission strain and build it up over the course of a couple of rounds adding five more cards to complete the strain through to stage four as you see in the picture. This strain puts my virus three quarters of the way to completion at 75 points; with a couple of double value vector cards I’d be even closer to 100%! A vector is usually worth 5 points but in some special cases can be worth double if placed on specific strains. Vectors are other ways in which your virus is transmitted via a carrier such as flies or droplets, so these go behind the transmission because they are an additional means of transmission for your virus. 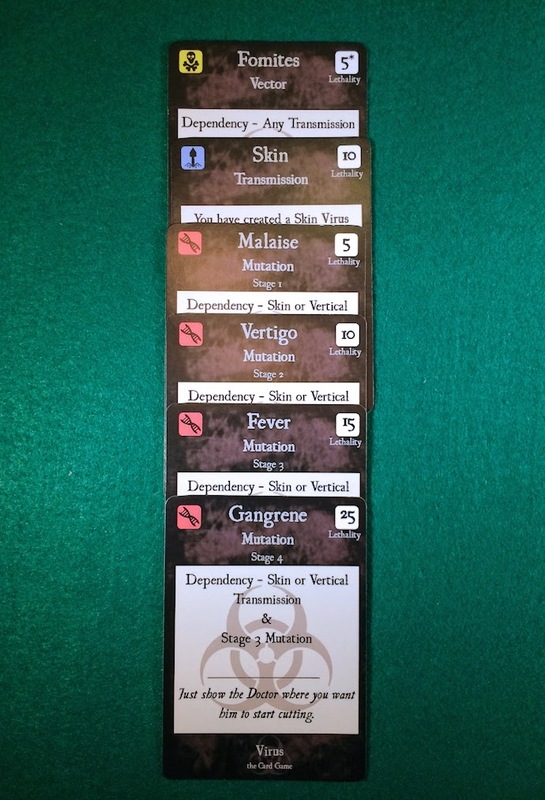 Mutations go in front of the transmission cards since they represent the different stages the virus progresses through as it becomes stronger and more lethal. These start with a lethality rating of 5 and go as high as 25 in stage four, so if you can hold onto a stage four card it can pay off for you quite well. The virulence card is another interesting card that is always good to keep in your hand because it’s a wildcard that can be used for any stage of any virus strain. It is a mutation card that has a low lethality rating of only 5 but its greater value is in its flexibility to be used at any stage with any transmission. Sometimes you may find yourself with a stage three and four card in your hand, of a strain you’re building but you have no stage two card to lay down after your stage one card. Without that stage two card, you would be forced to discard them since you can’t use them yet. 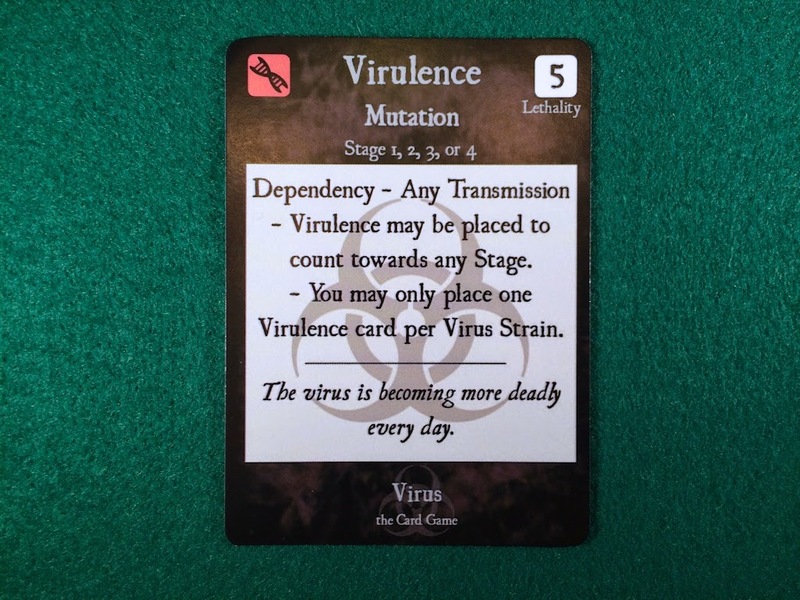 However, if you have the virulence card in your hand, you can use its ability to bridge that gap and place it as the stage two card which allows you to place those other, higher value cards on the strain. The only issue I have with the gameplay is what I call the tough luck factor and it can be a big one at times if you don’t house rule it. As the game is designed, you draw six cards and play any cards you can in your hand, keeping only one card before drawing back to a full hand of six. You can choose to discard your entire hand if you have nothing to play and here is where the issue can arise. If you are unlucky enough to run through several hands and get no transmission cards at all (and this has happened to me on multiple occasions) you will find yourself not only behind everyone else pretty quick but out of the game entirely before you get to participate. I have corrected that for when I play with a simple variant I will include in my closing comments, it works very well and removes any tough luck you may have dealt with otherwise. Aside from the above issue, I find the gameplay very smooth and easy. It’s not a brain burner and no one will suffer from AP. You draw, place cards, discard and repeat. Once you hit 100% lethality the game is over, if more than one player reaches the 100% limit the winner is decided by who has the higher percentage over 100. The components are very good quality with simple, effective and fitting graphics that provide the information necessary so the players know what to do with their cards. In a strange twist for a Kickstarter game, Virus was delivered a month ahead of its projected Kickstarter delivery! That is a testament to the great prep work done by Around the Clock Games coupled with the excellent publishing job handled by The Game Crafter. The luck factor I talked about earlier can be dealt with via house rules. When I play, I use a simple variant to make sure every player is engaged right away and it removes the tough luck problem. Simply remove all of the transmission cards, shuffle them and set them aside as the transmission deck. Shuffle the remaining mutation and vector cards into another separate pile and deal six of those to each player along with one transmission card, this way everyone starts with a transmission card face up and ready to build from. Play proceeds as normal every round with the only change being the two decks to draw from. If you choose to draw from the mutation/vector deck, you may take up to six cards as normal but if you take from the transmission deck (still with a maximum of three transmissions per player) you do not draw from the m/v deck. Virus the Card Game is a neat take on set collection that makes for a very quick playing filler that is both easy to teach and play but it doesn't offer anything groundbreaking. The main drawbacks to the game are the luck factor and no player interaction, making this game a multiplayer solitaire race to the finish which can make the game stale after several plays. Mark has told me that he plans on adding an expansion which will include player interaction in the future and I’m interested to see what he has in store for us. The base game is not a bad start and has plenty of room for expansion and improvement to further the core gameplay, which will be needed for the game to catch on. If you’re looking for a quick set collection game with a unique subject matter and want to support a local indie designer, then I recommend giving Virus the Card Game a look. Find me at a Nerd Night event and we can run through a couple of games so you can see if you like the game. Around the Clock Games is currently running their second Kickstarter project for their new card game, Airline. If Virus piques your interest, you can back Airline and get Virus together at the $39 pledge level currently. Maurice is an IT guy from Allen and is a board game reviewer at Club Fantasci, where he covers past and current games along with upcoming Kickstarter projects. In his spare time (while not killing zombies) Maurice does color commentary for a pro hockey team and you can find him at his favorite gaming haunt, Madness Games & Comics in Plano with his wife on Saturday nights. He plans on getting to more Nerd Night events especially those at the Dallas Games Marathon too. You can find Maurice on Facebook or Twitter or via email.